Students across the district competed in campus spelling bees last week to prepare for the district spelling bee on Feb. 6. Students across the district competed in campus spelling bees last week to prepare for the district spelling bee on Feb. 6. Hundreds of students at elementary and middle school campuses braved the microphone and did their best at spelling the words called. The best speller from each campus will compete in the district spelling bee for a chance to advance to the regional bee and beyond. 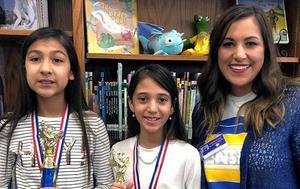 We will keep the spelling bee results coming on Frenship’s website and social media. Good luck to all the spellers this week!